Welcome to Ice-Break Mountain, a nation of communication, relationship formation and growth. Find a new way of conversing, with Ice-Break’s Mountain new language and new code of conduct. 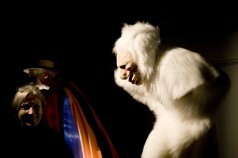 Learn from the Himalayan Cryptid Yeti and work your magic in Shunt’s unique speed dating event. You may even participate in your very own wedding ceremony. But be sure to make friends, be sure to canvass your nation’s appeal in order to be in with a chance of surviving. 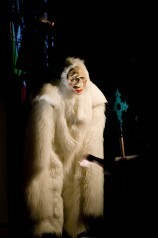 Our Holy Text on our Holy Mountain was written by the Yeti, and points the way to effective communication. Contrary to popular belief, Yeti’s are very good communicators – making use of a full range of non-verbal signals to achieve a deep understanding. This can be achieved by finding out the three most important things about the target of your attention. 1. How many fillings have they got? 2. What posters (if any) did/do they have on their bedroom/cave wall? 3. Do they understand they are mortal, or do they expect to live forever? From these three things a Yeti can tell much. The subject’s age and health, the subject’s sexuality and outlook. Their chances of finding happiness. How many rings have they? If any, why do they wear them? On which fingers (or toes)? Do they have fur? Much can be learnt from our sense of smell. Inhale Deeply. Now, say the first thing that comes in to your mind. Inhale again. Is their a slight tone of burnt hair? A bass note of artificial pine? A hint of cherry?